RoboControl is a remote control for your robot. It sends commands to your robot and reads sensor data from your robot. It provides remote monitoring using your robot, an iPod touch and RoboWebCam which makes it perfect for monitoring your home while you’re away. It also provides telepresence using your robot, an iPod touch and Skype which makes it perfect for interacting with loved ones when you wish you were there. It is a Web application that can be used from any computer or device with any browser on any platform. It is optimized for the iPhone and iPod touch. No homemade electronics or programming is required. Basic computer skills are required. The purpose of this document is to provide users with a step-by-step guide on how to setup and use RoboControl. The scope of this document is limited to providing guidance on RoboControl. For assistance on the hardware required by RoboControl, contact the manufacturers of this hardware. Basic configuration: Remote control of your robot with RoboControl. Remote monitoring configuration (optional): Remote control of your robot with RoboControl, and remote monitoring with an iPod touch and RoboWebCam. Telepresence configuration (optional): Remote control of your robot with RoboControl, and telepresence with an iPod touch and Skype. BA: required for basic configuration only. RM: required for remote monitoring configuration only. TP: required for telepresence configuration only. Send commands to your robot. Receive sensor data from your robot. Monitor your home remotely using the camera of an iPod touch mounted on your robot and RoboWebCam. Interact with people remotely using the camera of an iPod touch mounted on your robot and Skype. Web server and browser included with the application. Client running on any browser, any device and any platform (limited to a PC or a Mac when using telepresense). Client computer or device with a Web browser and Internet connectivity (BA and RM). Client PC or Mac with a Web browser, Internet connectivity and Skype (TP). Server computer running Windows XP, Vista, 7 or 8 with Bluetooth wireless and Internet connectivity. iPod touch 4th generation with mounting device (RM and TP), RoboWebCam (RM) and Skype (TP). Solar charger with adhesive Velcro (RM and TP for Roomba and Create only). To view the robot components. The Rootooth is a class 1 Bluetooth device which provides a range of 100 meters (330 feets). The Mindstorms NXT is equipped with a class 2 Bluetooth device which provides a range of 10 meters (33 feets). To get the best range and performance, you should have a Bluetooth class 1 radio on your server computer. To order Roomba, Create or Mindstorms NXT. To order RooTooth Bluetooth device. To order iPod touch (RM and TP). To order iPod touch mount (RM and TP). To order a solar charger (RM and TP). Response time: There can be a perceivable delay between sending a command and the execution of that command by your robot when commands are sent through the Internet. iPod touch battery autonomy: The iPod touch and solar charger fully charged can provide autonomy of your mounted iPod touch for up to 10 hours with the remote monitoring configuration (RM) and up to one week with the telepresence configuration (TP). If you need assistance in setting up or using RoboControl, visit www.roboticapp.com/support.html or send us an email at support@roboticapp.com. Introduction: Introduction to this document. Robot setup: Steps to setup hardware on your robot. Accounts setup: Steps to setup accounts for alerts, dashboards and social network. Server setup: Steps to setup software on your server computer. Client setup: Steps to setup software on your client computer (TP). Getting started: Steps to start RoboControl. Controls and sensors: Instructions on how to control your robot and read its sensors using RoboControl. Trademarks: Trademarks used thoughout this document. Install RoboWebCam on iPod touch (RM). Install Skype on iPod touch (TP). Create Skype Account for iPod touch (TP). Configure Skype on iPod touch (TP). RoboControl uses the RooTooth Bluetooth device to communicate with your robot wirelessly. It uses an iPod touch mounted on your robot as a wireless camera to provide remote monitoring and telepresence (RM and TP). The iPod touch is mounted on your robot using a standard car windshield mount (RM and TP). The iPod touch is connected to a solar charger to increase the autonomy of its battery using a standard iPod touch USB cable (RM and TP). The solar charger is mounted on your robot using adhesive Velcro (RM and TP). Remove your robot from its docking station. Turn off your robot by pressing and holding the "CLEAN/POWER" button until it powers down. Remove the faceplate or serial port protector from your Roomba, or the serial port protector from your Create. Connect the RooTooth to your Roomba or Create 7 pin mini din serial port. Turn on your robot by pressing the "CLEAN/POWER" button. Attach the iPod touch windshield mount to your Roomba or Create using the suction cup (use an adhesive base if necessary) (RM and TP). Attach the iPod touch to the windshield mount (RM and TP). Put one Velcro adhesive strip on your robot (RM and TP). Put another Velcro adhesive strip on the back of the solar charger (RM and TP). Attach the solar charger to your robot (RM and TP). Connect the solar charger to iPod touch (RM and TP). To view the procedure with screenshots. Build the robot from the "Lego Mindstorms User Guide" (pages 5 to 15) provided with your kit. Connect the sensors according to the standard port settings as described in the "Lego Mindstorms User Guide" (pages 16 to 17) provided with your kit. Build an iPod touch mount at the front of your robot using Lego bricks (RM and TP). Attach the iPod touch to your robot (RM and TP). RoboWebCam provides mobile remote monitoring with your robot and an iPod touch. Start the iPod touch mounted on your robot. Press the "App Store" app. In the search field, enter "RoboWebCam" and press "Search". RoboWebCam needs to have its port and password set before being used. The default port is "12346" and the default password is "password". The modified port and password will persist even after shutting down RoboWebCam or turning off your iPod touch. Press the "Settings" button to navigate to the "Settings" panel. Set the port number to be used to connect to RoboWebCam and press "Continue". Set the password to be used to connect to RoboWebCam and press "Continue". Auto-Lock must be set to "Never" on the iPod touch when using RoboWebCam. Skype provides telepresence capabilities with bi-directional voice and video between your robot and the client computer. In the search field, enter "Skype" and press "Search". Two Skype accounts are required by RoboControl. One account is used on the iPod touch mounted on your robot. The other account is used on the client computer. Open your Web browser and go to address www.skype.com. Click on the "Create an account" tab. Fill the following fields: First name, Last name, Your email address and Repeat email. Fill the following fields: Birth date, Gender, Country/region, City, Language and Mobile phone number. Fill the following fields: How do you intend to use Skype?, Skype name, Password, Repeat password and Type the text above here. Click "I agree – Continue". Skype must be configured on the iPod touch mounted on your robot to never go offline so that a connection to the robot can be establish at any time. Set "Sign In Automatically" to "ON" and "Go Offline" to "Never ". Press the "Home" button at the bottom of the iPod touch. Scroll to the "Skype" app. Press the "Increase Volume" button on the left of the iPod touch to increase volume to its maximum setting. RoboControl provides optional capabilities for Email and SMS alerts with Gmail, sensor dashboard displays with MyRobots and ThingSpeak, and robot social networking with Facebook. RoboControl requires a Gmail account to send Email and SMS alerts. This account can be your own or you can create one for your robot. To view the list of alerts. Fill the following mandatory fields: Name, Choose your username, Choose your password, Confirm your password, Birthday, Gender, Prove you're not a robot and Location. RoboControl provides capabilities to transfer your robot sensor data to an account on the MyRobots portal. This allows you to see the evolution of your robot sensors over time. When your robot is active, sensor data is transfered once every minute. When it is not active, sensor data is transfered once every hour. Fill the following mandatory fields: User Name, E-mail, Password, Confirm Password, First Name, Last Name, Gender and Country. Set "Robot Type" to "IRobot Roomba". Click the magnifying glass to get the API key required by the installer. RoboControl provides capabilities to transfer your robot sensor data to an account on the ThingSpeak portal. This allows you to see the evolution of your robot sensors over time. When your robot is active, sensor data is transfered once every minute. When it is not active, sensor data is transfered once every hour. Fill the following mandatory fields: User ID, E-mail, Time Zone, Password and Password Confirmation. Click the "Channel Settings" tab. Fill Fields 1 to 6 with the following values: Left Wheel, Right Wheel, Vacuum, Bumper, Cliff and Battery. Click the "API Key" tab to get the API key required by the installer. RoboControl provides capabilities to automatically create posts on the Facebook account of your robot. Limitation: The access token generated by Facebook and used by RoboControl has a lifespan of only a few hours. You will need to generate a new one and update your RoboControl settings once it has expired if you want your robot to keep on posting to its wall. To view the list of posts (same as alerts). Fill the following mandatory fields: First Name, Last Name, Your Email, Re-enter Email, New Password, Birthday, and Male or Female. Click on the "Get Access Token" button. On the "Select Permissions" window, click "Clear". On the "Select Permissions" window, click "Extended Permissions". Under the "Extended Permissions" tab, select the following options: offline_access, publish_stream and read_stream. Click the "Get Access token" button. On the "Graph API Explorer" window, click "Log In with Facebook". On the "Request for Permissions" screen, click "Allow". Get the access token required by the installer from the "Access Token" field. Setup Router (required only if RoboControl is to be used over the Internet). This procedure will setup the connection between your computer and your robot. Once the connection is established, you should be able to remove the Bluetooth device from your robot and put it back in without having to re-execute this procedure. Plug-in a Bluetooth class 1 USB radio to your computer (not required if Bluetooth class 1 radio is already embedded in your computer). Click "Start > Control Panel". In the "Control Panel" window, click "Hardware and Sound". In the "Hardware and Sound" window, click "Devices and Printers". In the "Devices and Printers" window, click "Add a Device". In the "Add a Device" window, double-click "FireFly-XXXX" for RooTooth or "NXT" for Mindstorms NXT. Click "Enter the device’s pairing code". Enter "1234" for the pairing code of RooTooth or Mindstorms NXT and click "Next" (you need to accept pairing on the Mindstorms NXT screen). Download "robocontrol.exe" from www.roboticapp.com to a temporary folder. Double-click the "robocontrol.exe" self-extracting executable. This procedure will setup your router and firewall for RoboControl. 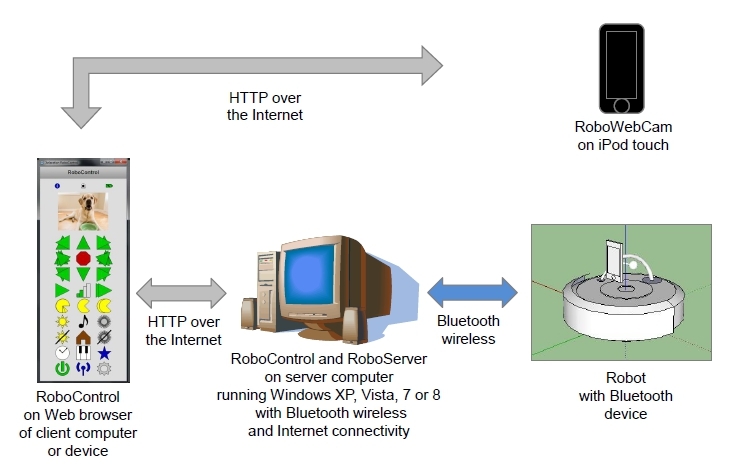 RoboControl and RoboServer Console use the HTTP protocol for communication between the Web browser on your client computer or device and your server computer. 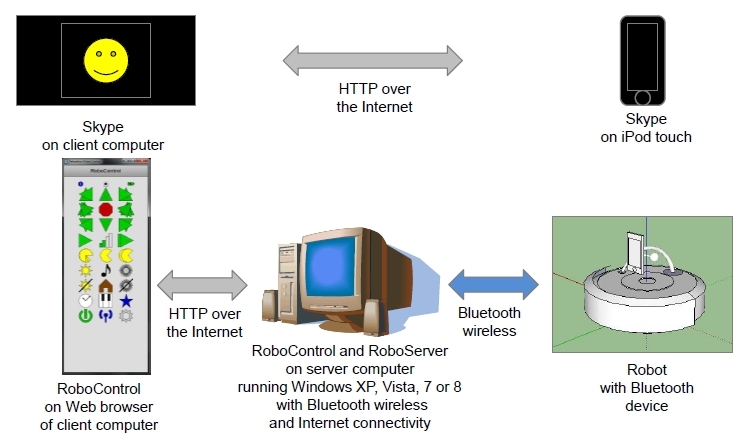 RoboServer also uses the TCP protocol for communication with RoboControl. RoboControl and RoboServer require your router to have the HTTP protocol port of your choice (80 by default) mapped to your server computer private IP address. RoboControl and RoboServer also require your server computer to have the port of your choice (80 by default) opened on your Windows and anti-virus firewalls. The steps that follow are based on a Cisco Linksys router. Depending on the make and model of your router, these steps may vary. This procedure is required only if RoboControl is to be used over the Internet. Open a Web browser and enter the address of your router (for example 192.168.1.1). Enter your "User name" and "Password" if your router requires authentication, and click "OK". Select the "Applications & Gaming" tab. Select the "Single Port Forwarding" tab. External port: Port you selected for RoboControl during installation (default 80). Internal port: Port you selected for RoboControl during installation (default 80). To IP Address: IP address of your server computer. External port: Port you selected for RoboServer during installation (default 12345). Internal port: Port you selected for RoboServer during installation (default 12345). External port: Port you selected for RoboWebCam during installation (default 12346). Internal port: Port you selected for RoboWebCam during installation (default 12346). To IP Address: IP address of your iOS device running RoboWebCam. Install Skype on Client (TP). Create Skype Account for Client (TP). Click "Get Skype > Windows". Click "Save > Save As". In the "Save As" window, navigate to a temporary folder and click "Save". In the temporary folder, double-click on "SkypeSetup.exe". In the "Skype – Install" window, select "Language" and click "I agree – next". Click on "Start > All Programs > Skype > Skype" from the Start menu or double-click on the "Skype" shortcut from the Desktop. In the "Skype" window, click "Create a new account". Start RoboControl with RoboWebCam (RM). Start RoboControl with Skype (TP). The Web server needs to be started prior to using RoboControl. It can only be started and stopped from your server computer. To ensure availability of the Web server at all times, set your server computer to never sleep. To set your server computer to never sleep, click "Start > Control Panel", under the "Control Panel" window, click "System and Security > Power Options > Change when computer sleeps" and set "Put the computer to sleep" to "Never". Click "Start > All Programs > RoboControl > Start Web Server". RoboServer needs to be started prior to using RoboControl. It can be started from your server computer or from any computer or devide connected to the Internet. To ensure availability of RoboServer at all times, set your server computer to never sleep. To set your server computer to never sleep, click "Start > Control Panel", under the "Control Panel" window, click "System and Security > Power Options > Change when computer sleeps" and set "Put the computer to sleep" to "Never". Click "Start > All Programs > RoboControl > Start RoboServer". Start a Web browser on any computer or device connected to the Internet. In the address field of the Web browser, enter: "your http server address/robocontrol/server.html" (for example "http://www.xelaration.net/robocontrol/server.html"). Enter your UserId and Password, and click "Login". Press the red power button to start RoboServer (Once started, the power button turns green). RoboControl can run directly on your server computer or on any Web client connected to the Internet. On your server computer, it can be started from the Start menu or from the RoboControl shortcut located on your computer desktop. On the Web client, it can be started by entering the RoboControl URL in the address field of any Web browser. To ensure availability of RoboControl at all times, set your server computer to never sleep. To set your server computer to never sleep, click "Start > Control Panel", under the "Control Panel" window, click "System and Security > Power Options > Change when computer sleeps" and set "Put the computer to sleep" to "Never". Click "Start > All Programs > RoboControl > Start RoboControl" or double-click the "RoboControl" shortcut located on the desktop. Control your robot and get sensor data as described in section Controls and Sensors. In the address field of the Web browser, enter: "your http server address/robocontrol/index.html" (for example "http://www.xelaration.net/robocontrol/index.html"). RoboControl can run directly on your server computer or on any Web client connected to the Internet. On your server computer, it can be started from the Start menu or from the RoboControl shortcut located on the desktop. On the Web client, it can be started by entering the RoboControl URL in the address field of any Web browser. RoboWebCam runs on the iPod touch mounted on your robot. To ensure availability of RoboControl at all times, set your server computer to never sleep. To set your server computer to never sleep, click "Start > Control Panel", under the "Control Panel" window, click "System and Security > Power Options > Change when computer sleeps" and set "Put the computer to sleep" to "Never". Press the "WebCam" icon at the top of the "Controls" or "Favorites" panel. When prompt to authenticate, enter any user id and the RoboWebCam password (default is "password"), and click "Log In". Start the iPod touch mounted on your robot (this step cannot be performed remotely). Press the "RoboWebCam" app (this step cannot be performed remotely). RoboControl can run directly on your server computer or on any client computer with any Web browser and Skype connected to the Internet. On your server computer, it can be started from the Start menu or from the RoboControl shortcut located on the desktop. On the client computer, it can be started by entering the RoboControl URL in the address field of any Web browser. Skype video on the client computer connects to Skype video on the iPod touch mounted on your robot. To ensure availability of RoboControl at all times, set your server computer to never sleep. To set your server computer to never sleep, click "Start > Control Panel", under the "Control Panel" window, click "System and Security > Power Options > Change when computer sleeps" and set "Put the computer to sleep" to "Never". Click "Start > All Programs > Skype > Skype" or double-click on the "Skype" shortcut located on the desktop. On the "Skype" window, enter "Skype Name" and "Password", and click "Sign me in". On the "Skype - Welcome screen" window, click on "Or get started now…". In the "Skype" window, click your robot contact. Someone presses the green camera button on the iPod touch mounted on your robot. Click on the "Pop-out" button. In the address field of the Web browser enter: "your http server address/robocontrol/index.html" (for example "http://www.xelaration.net/robocontrol/index.html"). RoboServer Console can run directly on your server computer or any Web client. On your server computer, it can be started from the Start menu. On any Web client, it can be started by entering the RoboServer Console URL in the address field of a Web browser. Click "Start > All Programs > RoboControl > Start RoboServer Console". Press the green power button to stop RoboServer (Once stopped, the power button turns red). RoboServer can be stopped from your server computer or any Web client. On your server computer, it can be stopped from the Start menu. On any Web client, it can be stopped by entering the RoboServer Console URL in the address field of the Web browser and by pressing the green power button. Click "Start > All Programs > RoboControl > Stop RoboServer". The Web server can only be started and stopped from your server computer. Click "Start > All Programs > RoboControl > Stop Web Server". The Update RoboControl utility will update RoboControl on your server computer. Click "Start > All Programs > RoboControl > Update RoboControl". Home directory "C:\Program Files\RoboControl", or any home directory you selected during installation, and all its content. All shortcuts under the folder "Start > All Programs > RoboControl" and the folder itself. Shortcut "RoboControl" on your computer desktop. Click "Start > All Programs > RoboControl > Uninstall RoboControl". The View RoboControl User's Guide shortcut links to this page. Click "Start > All Programs > RoboControl > View RoboControl User’s Guide". In the address field of the Web browser, enter www.roboticapp.com/control30.html. Controls: Controls to send commands to your robot. Sensors: State of your robot sensors. Schedule: Management of the cleaning schedule. Favorites: Emoticon, geometric patterns, musical tunes and dance. To view the list of all valid controls. iRobot Roomba Open Interface (ROI) Specification (Adobe Reader required). iRobot Create Open Interface (Adobe Reader required). iRobot Roomba 500 Open Interface (OI) Specification (Adobe Reader required). RoboDynamic RooTooth User Guide (Adobe Reader required). RoboControl, RoboServer and RoboWebCam are trademarks of Xelaration Software Corporation. Xelaration is a registered trademark of Xelaration Holding Corporation. Roomba and Create are registered trademarks of iRobot Corporation in the United States. Mindstorms is a trademark of the LEGO Group. iPhone, iPod touch, iPad and iPad mini are trademarks of Apple Inc., registered in the United States and other countries. Skype is a trade mark of Skype Limited and Xelaration Software Corporation is not affiliated, sponsored, authorized or otherwise associated by/with the Skype group of companies. Cisco and Linksys are registered trademarks of Cisco Systems Incorporated.